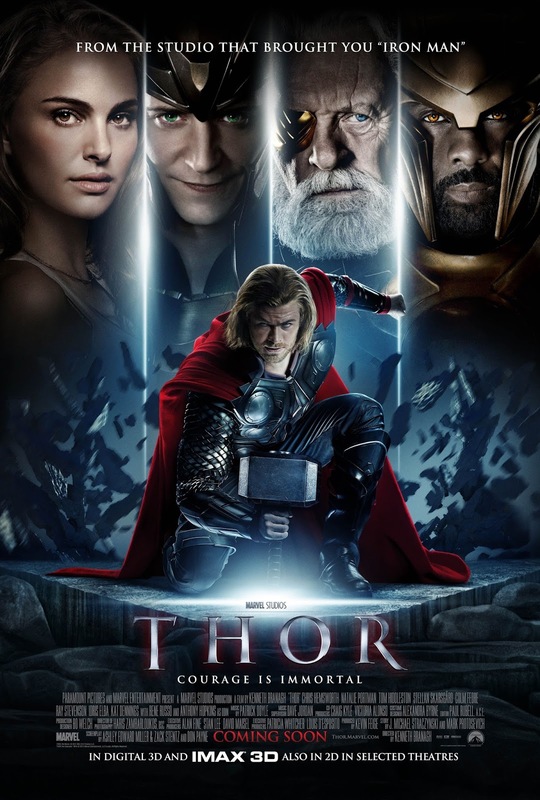 My march through the Marvel movie catalogue continued tonight with THOR (2011), and once again I was a happy viewer. I've been curious to know how on earth (or should I say "how on Asgard") Nordic gods fit in the Marvel universe, where the other superheroes' powers are at least ostensibly science-based. Now I know! And it works surprisingly well. Thor (Chris Hemsworth), the heir of wise King Odin (Anthony Hopkins) of Asgard, is much too arrogant for his own good. When Thor goes to battle with the Frost People, with whom Asgard has had a truce, the despairing Odin banishes Thor to earth. 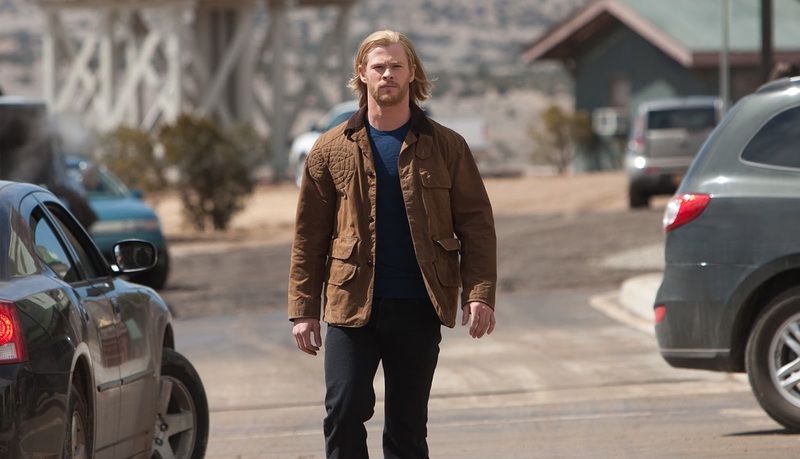 Stripped of his powers, Thor lands in New Mexico, followed by his magical hammer Mjolnir; the immovable hammer in the middle of the desert draws considerable attention, including from Agent Coulson (Clark Gregg) and the agents of SHIELD. Thor is stunned to discover that he can no longer pick the hammer up, and it sits there waiting for the right person, rather like the Sword in the Stone. 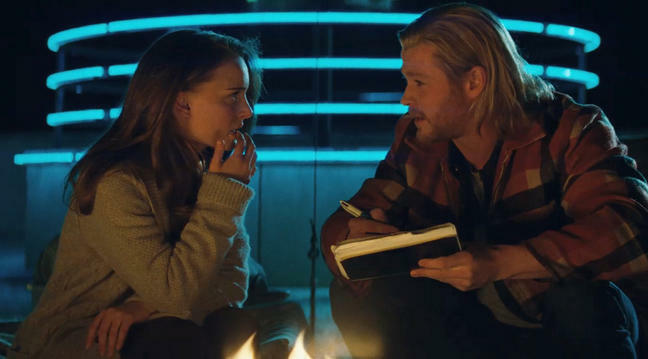 Thor is aided by scientist Jane (Natalie Portman), who isn't sure if the handsome, strong stranger is a mental case...or the confirmation of her theory that there are realms in the universe beyond our own. For his part, Thor begins to learn about love, humility, and self-sacrifice. Back home in Asgard, Thor's brother Loki (Tom Hiddleston) does not take well to the news that he was adopted from the Frost People by Odin and his wife Frigga (an underused Rene Russo). Moreover, it's gradually revealed that Loki engineered Thor's banishment and would like to see both Thor and Odin dead so he can rule as king. There's a lot going on, but it's surprisingly easy to follow the story, at least most of the time. This was another very satisfying film in the Marvel series. I can't say I was all that excited about watching the opening battle sequences which set up the story, but on the whole the film was very well done. The movie spends equal time in Asgard and on earth, introducing audiences to concepts such as the Rainbow Bridge, the all-knowing gatekeeper Heimdall (Idris Elba), and Thor's Hammer along the way. Australian actor Chris Hemsworth is perfectly cast as Thor, conveying both his initial arrogance and his ultimate worthiness. The moment when Thor begins to pound the Rainbow Bridge to pieces, which will save Jane from evil Loki but also prevent Thor from returning to her himself, was truly moving. Even better is the scene where Thor proves himself worthy at last to carry his hammer, a truly exciting moment. THOR simultaneously tells a very original story while borrowing bits and pieces of Disney movie lore, whether it's THE SWORD IN THE STONE (1963) or the concept of a sleeping prince or princess. The movie also, inadvertently or not, anticipates various aspects of FROZEN (2013). 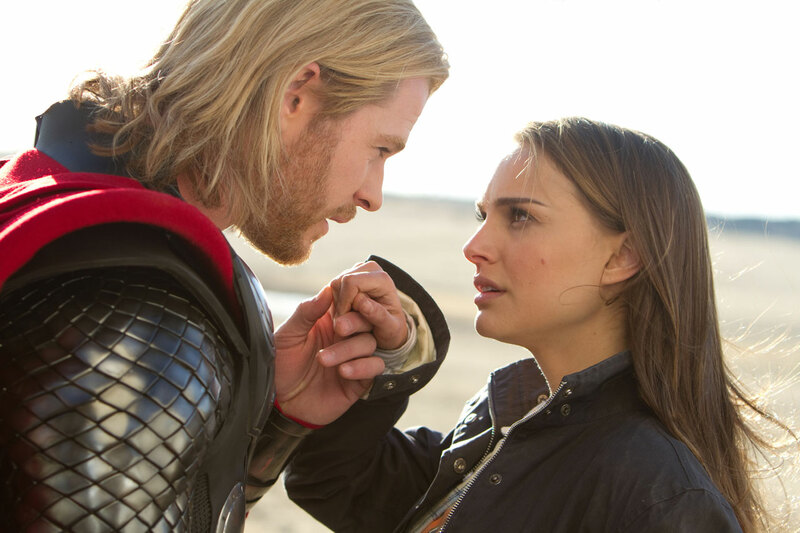 It also won't be lost on most viewers that leading lady Natalie Portman was also a part of the STAR WARS universe, which again gives THOR a familiar feel despite the unusual story. Speaking of STAR WARS, the conclusion of THOR was reminiscent of THE EMPIRE STRIKES BACK (1980), inasmuch as many things are left way up in the air, awaiting resolution in future chapters. Thor returns in THE AVENGERS (2012), and then he and Jane will apparently be reunited in THOR: THE DARK WORLD (2013). 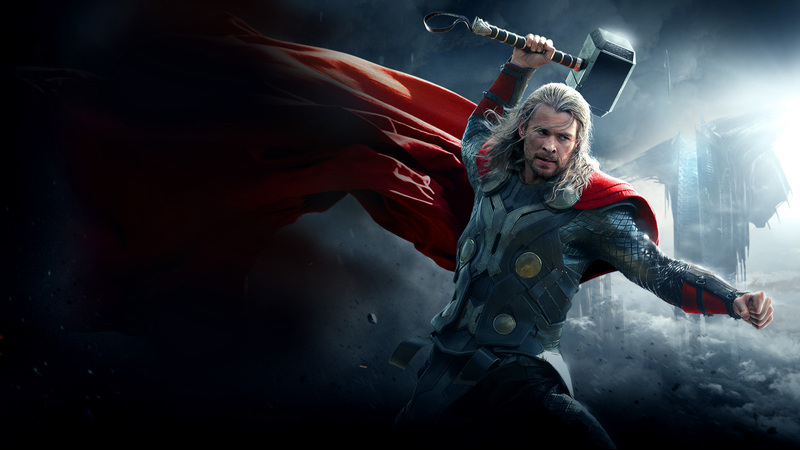 Another THOR film, THOR: RAGNAROK, is scheduled for 2017. This was the third film I've seen which was directed by actor Kenneth Branagh, following JACK RYAN: SHADOW RECRUIT (2014) and CINDERELLA (2015). All three films were winners for me. Branagh knows how to tell a good story. THOR runs 115 minutes. It was shot by Haris Zambarloukos. And yes, like all the other Marvel movies it's lacking a memorable musical score. Those first shots of Asgard should have been stunningly scored...instead we got elevator music. Parental Advisory: This film is rated PG-13 for "intense sci-fi action and violence." Like the other Marvel films, there's a lot of fighting but nothing gory or disturbing. THOR is available on DVD, Blu-ray, and Amazon streaming. The trailer is here. Previous Marvel reviews: CAPTAIN AMERICA: THE FIRST AVENGER (2011), CAPTAIN AMERICA: THE WINTER SOLDIER (2014), IRON MAN (2008), IRON MAN 2 (2010), AGENT CARTER (2015), and ANT-MAN (2015). 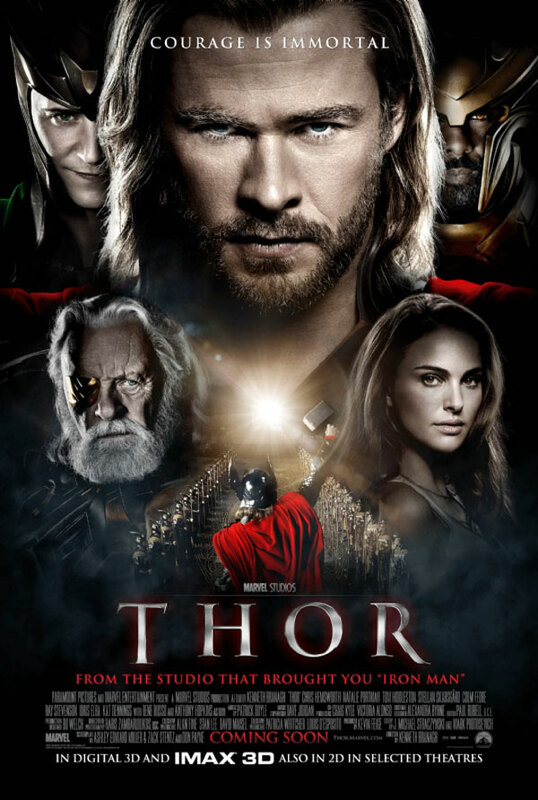 Update: Here's the link for a review of THOR: THE DARK WORLD (2013). I never got into reading Thor as a comic but I like the movies (this first one more than Dark World). Natalie Portman doesn't impress me in this character but the men are great, Hiddleston is an awesome trickster-god. Sounds like you enjoy Rene Russo as much as I do, love her! I've enjoyed Russo since seeing the Pierce Brosnan THOMAS CROWN AFFAIR, which came out way too many years ago now. (Grin) Would have liked seeing more of her as someone who can go toe to toe with men as powerful as her husband and son. Will be getting DARK WORLD soon and check it out. First, THE AVENGERS! And I'm halfway through AGENT CARTER.